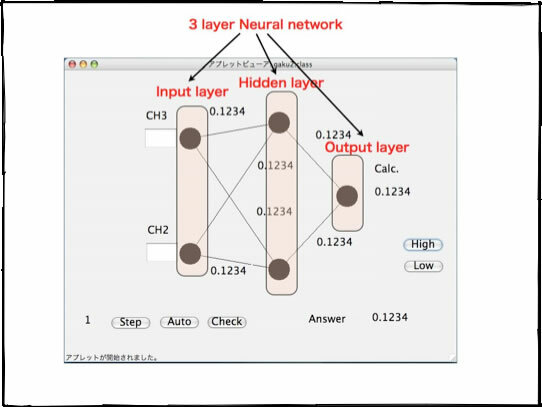 For the properties estimation purpose, I always use 3 layer Neural network. This structure is shown below. 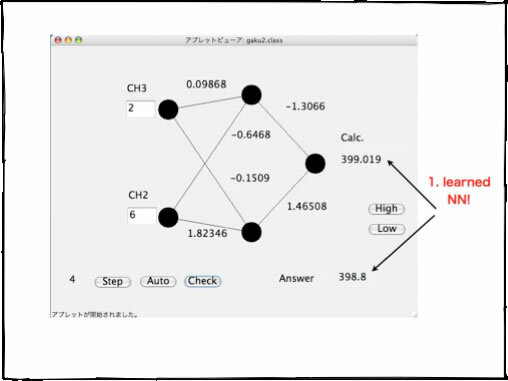 I explain the mechanism of NN learning with n-alkane compounds boiling point. If I plot carbon number to Boiling point, it become straight line in short range. i can find out if one CH2 group make increase BP 30.49K. 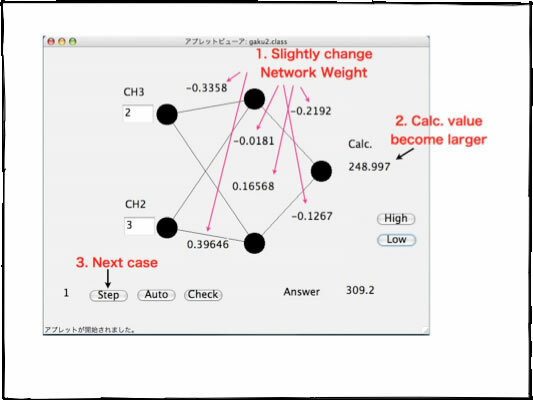 Let's make neural network of this issue. you can run this JAVA applet with separate window. 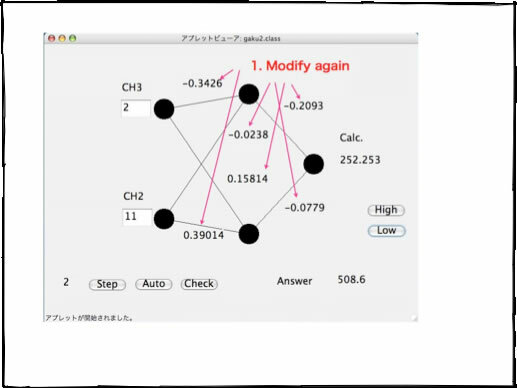 And please check the movement of NN learning. n-alkane compounds has two CH3 group and several CH2 group. The number of these group are submit to input layer neuron. 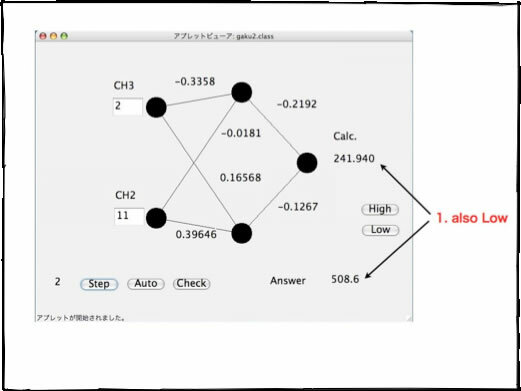 Then CH3=2, CH2=3 appear at input neuron. The initial Network Weights are determined by random value. Calculated Boiling point is appear. Experimental boiling point is 309.2 ℃, so push Low button. 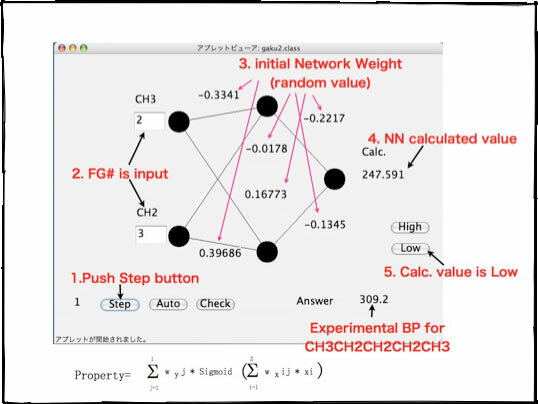 Initial network weights are determined by random value, so it is natural the result is so bad. When push the Low button, NN slightly change network weight so as to increase calculated boiling point become larger. Then push Step button to try next compound. Next compound case also Low. 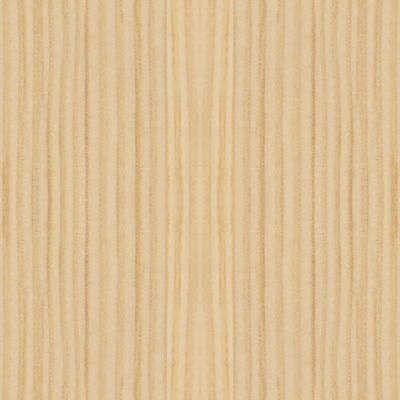 And continue to "Step" and "Low""High" selection several times manually. Then push Auto button. 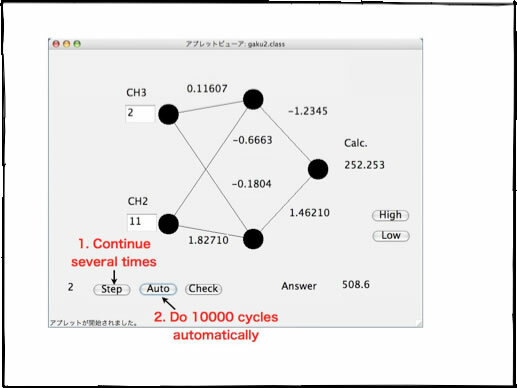 It will calculate 10000 cycles automatically. And network weight will not change if auto button is pushed several times. 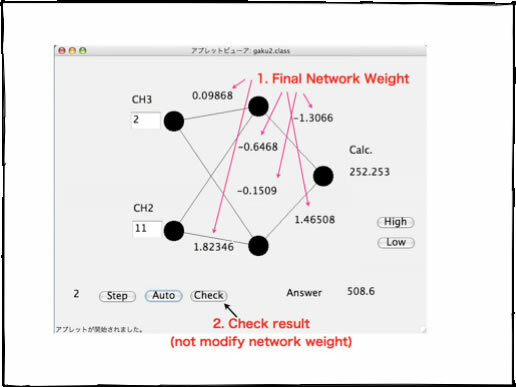 Then final network weights are obtained. And push check button. This button does not change network weight. Learned Neural Network can reply very good answer. 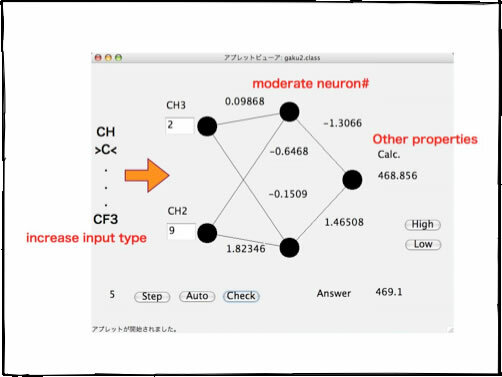 It is very easy to increase input neuron. And it is very easy to learn other properties. I made JAVA progarm that answer boiling point, and put it in Pirika HP. And put other prediction schemes to Thermo Chemical properties Estimation (TCPE) page.